<br>Test Drive Unlimited 2 transforms the driving genre, adding the persistency, progression and customization of the latest multiplayer games to the racing experience. 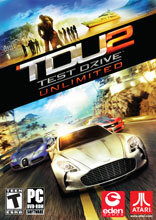 Test Drive Unlimited 2 blends single player and multiplayer Experiences seamlessly, creating a dynamic world of evolving content and challenges. Players define their online persona through unparalleled customization of their avatars and vehicles, and the acquisition of property, clothing and other accoutrements of a luxurious international lifestyle. The challenge comes to life with refinement and balance of the core Test Drive driving experience. All-new race types, vehicle classes, environmental challenges, locations and much more push this epic franchise to new levels of performance.